Channelview High School sophomore Yvette Leos hangs on tight to a calf during the Houston Livestock Show and Rodeo’s Calf Scramble at Reliant Stadium recently. Leos wasn’t able to hang on to this calf, but ended up grabbing another one to take to the winner’s circle. 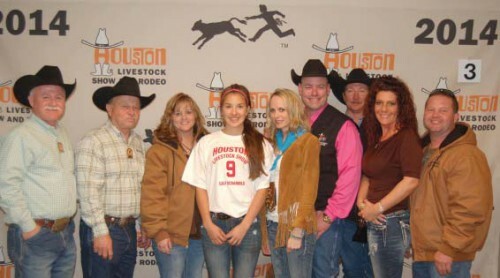 As she stepped into the dirt arena at Reliant Stadium, Yvette Leos looked up in amazement at the thousands of spectators and bright lights of the Houston Livestock Show and Rodeo. She and 30 others took their place in the spotlight – a 3-acre spotlight, that is. Their objective: catch one of 15 calves and bring it back to the center of the arena. Her eyes watched carefully at the starter’s hat. As his hat dropped, she took off in a full sprint with her sights on catching a calf. It was a task she truly took by the tail. However, the elusive calves had other ideas. “On my first few attempts, I grabbed them by the tail and got dragged a good 10 yards. Then, on another attempt, I got kicked in the head to the point my ear was bleeding. I never felt a real headache until that moment,” said Leos, a Channelview High School sophomore and first-year Future Farmers of America member. Leos said she has always wanted to participate in the HLS&R Calf Scramble. Yvette Leos, center, is all smiles after catching a calf at the 2014 Houston Livestock Show and Rodeo Calf Scramble. Celebrating the achievement are, from left, Channelview High School Agriculture instructors Wesley Hutchins and Dominic Mazoch and representatives from Rockin’ D Fencing Co., owned by Adan DeSplinter. For catching a calf at this year’s show, Leos received a $1,500 certificate to purchase a steer that she will show at the 2015 Houston Livestock Show and Rodeo. She will also receive $250 for turning in a record book of future experiences with the calf she will be raising this year. In addition to raising her new steer, she is also raising a goat and a pig that she plans to show in the future. Leos’ performance in the Calf Scramble certainly has made a memorable impression among her friends in FFA. 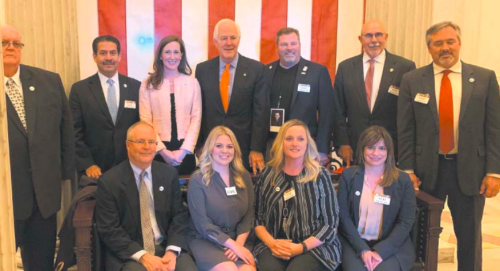 “Everyone I have told about my experience is shocked, because they didn’t realize that I am such a tough, brave, crazygirlwithalotofgutstodo such a thing as being a part of the biggest calf scramble in Texas,” she said.